In an open dialogue, the two artists and friends will talk about their artistic practice, inspirations and choices. 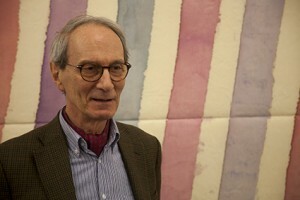 Born in 1936, Giorgio Griffa is one of the most radical and eloquent artists of the Italian neo-avant-garde. Although situated on the fringe of major contemporary trends, he associated himself at the start of his career with the movements Arte Povera in Italy and Supports/Surfaces in France. Griffa rose to prominence in the late 1960s for his paintings concentrated upon their fundamentals – canvas, brushstroke and colour – and for his capacity to reconcile analysis, poetry and lightness. Working on raw canvases laid flat on the ground, he applies his pale acrylic paints with brushes and sponges that release “the intelligence of the material”. Convinced of the continuum of creation, the artist entrusts his line to the canvas in a gesture without end. His process of creation includes innovative references to his predecessors, including Van Gogh, as well as to the divine proportion defined since antiquity by the golden ratio. Griffa’s works are shown in solo and group shows around the world and are held in major collections of contemporary art in Europe and the United States. 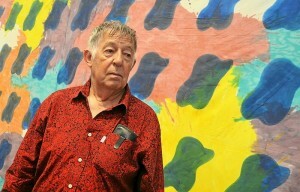 Born in 1936 in Nîmes, French artist Claude Viallat trained at the École des Beaux-Arts in Montpellier and Paris. As from the 1960s he embraced a radical critique of lyric and geometric abstraction and was one of the initiators of the Supports/Surfaces movement. He works chiefly on canvas or cloth without a stretcher, repeating the imprint of neutral forms in all their states. In his repetition of simple forms and his painting in acrylic on an unprimed canvas, we may recognize similarities with the art of his long-standing friend Giorgio Griffa, which is likewise characterized by a formal austerity. As from 1966, Claude Viallat put in place a formal vocabulary to which he would remain faithful. The oblong, rounded marks on Griffa’s paintings from the 1970s echo the ‘haricot’ forms that populate Viallat’s canvases. Colour is at the heart of his creative thinking and is both subject and object of an artistic production that can today be seen in the most prestigious galleries and international collections.